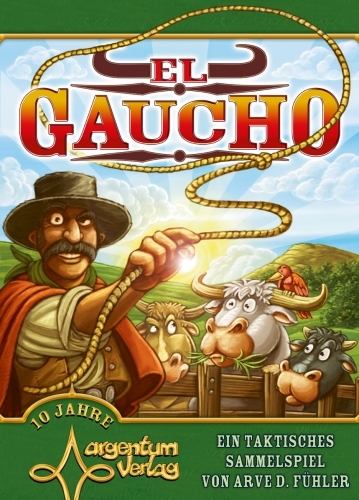 El Gaucho is a light set collection board game that plays in about an hour. It’s light and family friendly, while offering a little more than traditional set collection games such as rummy. The (mostly pasted on) theme backs the family game credentials, with players taking on the roll of Mexican cowboys (gauchos) tending to their herds (cows, represented by tiles). Its cartoony art style is really charming, with each cow oozing personality. It takes two to four players, with a two-player game with experienced players running as fast as 30 minutes. El Gaucho’s board is also very well drawn, while the cardboard ‘dice rodeo’ (fenced area to roll the dice) adding a nice bit of unusual bling. Throw in seven dice, custom meeples and a well laid out rulebook and you have a package well worth the £20 price tag. In terms of play, in a round one player will roll the dice (two per player, plus one) and then each player will choose two to use. Dice can be used to claim cows of relevant values, but also to claim action spaces. Some of these actions allow you to mess with other players or give other extra roles/abilities in later rounds, while helping to negate the problem of low roles (you can’t be blocked out of an action space by other players). The scoring is ingenious. Each cow of a breed (think card suit) scores the same value as the highest value same breed one in your herd: so if you have the 1,3,5 and 12 black cows, they are worth 12 each. This encourages players to save sets with a high numbered cow to score more later – but leaves the danger of another player stealing your prize beast before you do. In this example, losing your 12 would see your score cut from 48 (4×12) to 15 (3×5) – but you do at least score 12 in compensation when it’s stolen. As you’d expect from this kind of gateway game, teaching El Gaucho is a relatively simple affair. Turns are fast and all player information is open, so it is simple to give advice and reiterate things as you go. There are a few key points that need explaining well: gauchos played onto action spaces can never be used in the same round they’re placed, for example, or that if you steal a tile from another player they will be compensated its value. Also, cows are only claimed when all of those in a particular row on the board have been claimed. This can be important to set collection, as if you claim one out of sequence you must start a new set in that breed and score the old one (one action does mitigate this). But generally the rules are very simple to grasp. But there are some subtle and interesting moves to be made. For example one option is to lay ‘lazy gauchos’ onto cow tiles, essentially reserving them for later. This action can be manipulated to several ends – reserving, blocking, forcing rows to complete, or to save yourself a dice. But you should let your players discover these nuances for themselves, as this should hold the attention of more experienced gamers. The writer: I’m a fan of set collection games and went into this year’s Essen looking for lighter fare after a few years collecting some great mid-to-heavyweight euros. This and Johari seemed to fit the bill and both proved great buys. El Gaucho is very light, but there are interesting decisions to be made and games tend to be won by the person making the best calls throughout. And while not everyone has rushed out to buy a copy after playing, there have been no complaints either. The thinker: While I won’t be demanding this particular hour of my life back, I also won’t be rushing forward to play another game of El Gaucho any time soon. There is nothing wrong with the game, but despite all the bells and whistles (read: dice and actions) this is still a one-dimensional set collection game. At least Ticket to Ride has you building routes, giving some room for a long-term strategy; this is just rummy on steroids. Which is fine, if you like that sort of thing (which I don’t). The dabbler: El Gaucho is an absolute treat! The cows are gorgeous and funny, the board adds to the theme and the game is simple – but with a bit of depth. Super fast turns make it zip by and everyone is engaged throughout, as you need to know what’s going on with other players’ herds. And the dice rodeo is fab! It’s just a small thing, but works perfectly (dice flying everywhere can be a problem in games!) and helps add a little uniqueness to proceedings. The threat of thieving gauchos also ads to table banter, with everyone suggesting other players to steal from once someone goes into that action spot. Great fun. I think the large box, worker placement aspect and tiles, dice etc lead to a misconception about what’s inside – which is a shame, because played for what it is this is a solid and fun little game. But then taking El Gaucho is a glorified filler, isn’t it too expensive for what it is? Why pay so much for a game which is so fast and basic? I’d argue the game’s strong gateway potential, but also that £20 isn’t a high price for any well produced board game. What about Can’t Stop, or King of Tokyo? The components here are easily worth the game’s price. While El Gaucho isn’t for everyone, it easily found a place in my stock of gateway games. It’s different enough (and shorter) when compared to the likes of Ticket to Ride, Carcassonne and Settlers, while offering a lot to new gamers and just enough to more seasoned ones. Would I want to play it every day? No. Do I think it has hidden depths? Nope. But not every game has to, does it? Taken on its merits, it’s a fun and easily accessible game that doesn’t outstay its welcome. Except of course for when it does. Each game of El Gaucho I’ve enjoyed has been played in the right spirit, with players largely skipping through their turns and playing with smiles on their faces. But I’ve seen others playing in silence, staring at the board trying to grok it to death – and for those players, it must’ve been a truly miserable experience. If you like lighter games, in particular set collection ones, then I’d certainly advise you to get a play of El Gaucho – but terminally serious AP gamers need not apply. This entry was posted in Board games, Games and tagged board game, Board game review, board games, boardgame review, El Gaucho, El Gaucho review by Chris Marling. Bookmark the permalink. Great review. I’ve only played this once (with you at Essen), but I really enjoyed the game and would play it again without hesitation. I thought it provided enough of a unique feel to earn it’s own spot in a game collection. Thanks 🙂 It does feel unique, but it’s pretty standard ideas under a shiny surface. I don’t see this as a bad thing – but can understand why some people are disappointed if their expectations are too high going in.